We left early, climbing back up the first part of yesterday’s ridge before veering left along the undulating valley floor carved out by the Khumbu Glacier, dotted with massive boulders dropped as it passed. Kantega; ever-present Ama Dablam looming over us an imposing presence of black rock faces and white snow buttresses, a small grey glacier sweeping down its slopes. Several steep, heart-pounding pinches, only made easier by the delight of wildflowers everywhere, led to a welcome break beside a turf and slate roofed hut sheltering in the corner of one of many stone yak enclosures. 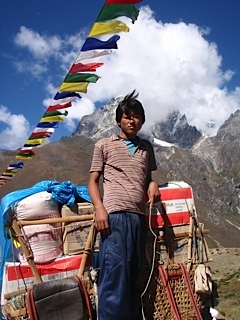 Our porters caught up and, after a brief rest, amused themselves (and us!) with break-dance moves on the cropped turf and high risk Sherpa rock hopping. Further up, Bree and I filmed a yak train crossing a high bridge from a rock by the track, the magnificent lead animal eyeing us warily as he trod past. After the bridge, we rose steeply to our lunch stop at Thukuche. I laughed aloud at the Fast Food sign, but heartily appreciated the food and hot drink. 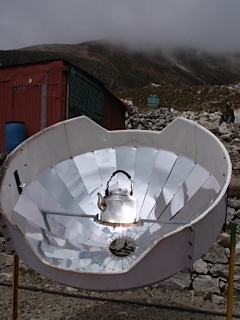 Several impressive solar cookers focussed their white-hot heat on kettles of water, and a notice on the door let locals know of a visiting eye clinic in October. beautiful place, though rather sad. I climbed a little away from the group and found a simple stone cairn wrapped in a prayer flag, exactly the sort of memorial I’d like to leave to my mother – shed a few tears, and walked on. Once we reached Lobuche, in keeping with wise advice to “climb high, sleep low”, Bhoj led us on a short acclimatization walk, clambered up a steep ridgeline (actually the lateral moraine wall). Suddenly one reaches the rim of this vast Khumbu glacier, a line of rock cairns marking the edge of a slope that dives down into a jumble of ice, rock, dirt and small perched lakes where the ice is melting. The entire valley floor is a chaotic upheaval of dirty brown ice and boulders, stretching 500m to the far wall. Temba explained how, not so many years ago, we would have been looking out at eye level across a slowly moving river of ice. Powerful. Stark. Implacable. We got our first real inkling of how cold it could be on our trek to Base Camp the next day. This entry was posted in Activism, Climate change, Environment, Foreign aid and development and tagged activism, AYCC, climate change, environment, Nepal, solar power by Philippa Rowland. Bookmark the permalink.